Recently, I have been reading an article from Elizabeth David’s ’An Omelette and a Glass of Wine’ almost every day. It is a collection of her work between 1955 and 1984 from publications including The Spectator, Vogue, Gourmet and The Sunday Times, and is without a doubt the best writing on food I have ever read. David’s observations reveal small but potent truths in the simplest contexts that extend far beyond their alimentary origin – and which are not focussed on her own person. The approach described is one that exemplifies the key qualities that make my mother’s cooking so good. Tending closely to a few ingredients is, I would argue, a complex process. Complex, because it involves pausing to engage with the particularities of flavour and texture of that item, and also with how those particularities respond to the application of heat, salt, sugar, acid and fat. It is an approach that acknowledges the fact that a world can be contained within, say, a single tomato (the history of the variety which may extend back centuries, the time taken by a person to prune, water and feed the tomato vine, the warmth of the sun that ripens it, and the earth that nourishes it and informs flavour, and so on). Furthermore, there is the combination with other ingredients to consider, which must bring their own set of qualities and cultural context to bear. Paying close attention can be transformative of vegetables: really scrutinising how and why you are cooking that particular vegetable can bring significant benefits. I recently experienced this fact when I discovered that cooking certain vegetables carefully over a very high heat can transform them (e.g. the courgette recipe a few weeks ago on this blog). I had just read the section in David’s book in which she discusses mussels at length, and her preference for the smaller, younger specimens, when I realised that they had just come into season, and so decided that Zoe and I would have them for a pre-going out supper. Among the herbs that David refers to as being good with mussels were tarragon and chervil. I decided on this occasion that tarragon was too strong, and that I would like to try chervil, which I had not cooked with before. It has a delicate grassy flavour with aniseed hints that were wonderful with the seashore flavours of the young moules. This is a very simple way to cook mussels, and is more or less my favourite. It takes very little time. 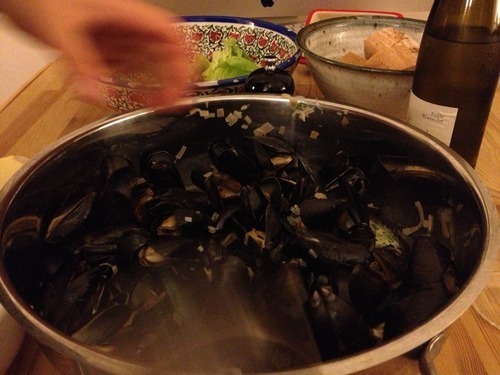 Fill a sink or large bowl with water, place in the mussels. Throw away floaters, or those that don’t close when you tap them sharply – they have passed on to another life (R.I.P.). Remove the beards and large barnacles from the rest, taking care not to fracture the shell. In a large pan on a medium heat sweat the shallots in a decent knob of butter until very soft, not allowing to brown. Add the mussels and a glass of wine and jam the lid on. Cook for 4-5 minutes, or until all of the mussels are open. Remove the mussels to two bowls. Take the pan off the heat and stir in the cream, check the seasoning – may not need much salt because of the saltiness of the mussels. And add as much salt and pepper as you wish for. Add a small squeeze of lemon, and the chervil and stir. Spoon over the mussels. Serve. 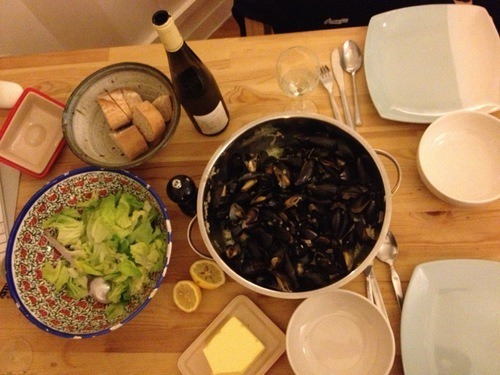 We had sourdough spelt with butter to soak up the juice and a green salad with the mussels. Do not eat any mussels that have not opened during cooking. A delicious white wine that Zoe bought from Market Row Wines in Brixton. Obviously, finely-cut, deep-fried hot chips are the best accompaniment if available.